The Crossover UniverseTM is a companion blog to the books Crossovers: A Secret Chronology of the World Volumes 1-2 by Win Scott Eckert, and the forthcoming Crossovers Expanded Volumes 1-2 by Sean Levin. Material excerpted from Crossovers Volumes 1 & 2 is © copyright 2010-2014 by Win Scott Eckert. All rights reserved. Material excerpted from Crossovers Expanded Volumes 1 & 2 is © copyright 2014-present by Sean Levin. All rights reserved. 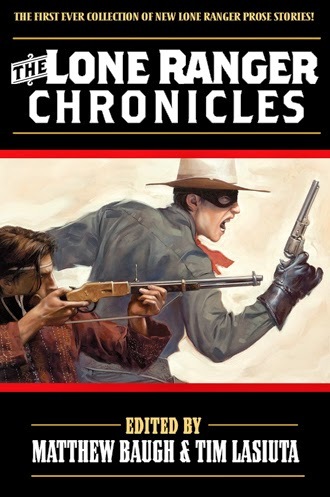 This anthology of new stories from featuring the iconic western hero, published by Moonstone Books, has three stories with crossovers, including "Kemosabe" by co-editor and creative mythographer Matthew Baugh. Joe Gentile's "Hell Street" is a team-up between the Ranger and Tonto and O. Henry's outlaw the Cisco Kid, while Troy D. Smith's "The Fallen Angel of Dodge City" has references to two other famous western heroes from radio and TV. The Crossover Universe™ is © copyright 2014 by Win Scott Eckert and Sean Levin. Simple theme. Powered by Blogger.